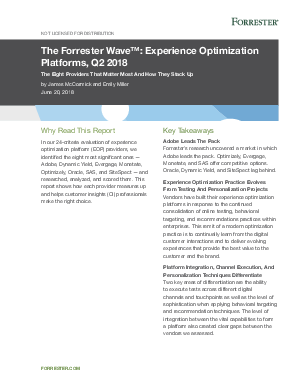 According to The Forrester Wave™: Experience Optimization Platforms, Q2 2018 report, as enterprises continue to consolidate online testing, behavioral targeting and recommendations practices, Experience Optimization Platform (EOP) Providers have been differentiating their services in two key areas: the ability to execute tests across digital channels, and sophistication of behavioral targeting and recommendation techniques. This report assesses the current offering, strategy, and market presence of eight EOP providers, including Monetate. Three core capabilities Forrester considers requirements for savvy optimization.